We asked our Board members to tell us about their first, most memorable, or most historically located labyrinth walk. Here are their stories. One of the greatest gifts I have ever received, and one of my most memorable labyrinth walks, happened while researching labyrinths in Sweden. Local family members brought me to an old, moss-covered labyrinth made of stones, located in the woods behind the original farmstead of my family. Hearing their stories and imagining my great-grandfather and his siblings running around those very stone pathways touched my soul and stirred a deep connection to my ancestors. Kay Whipple, President: Last November, I was thrilled to make the journey to San Francisco to meet my new little grandson for the first time. At Grace Cathedral I took little Thaddeus on his first labyrinth walk! It was so moving, with the organ playing, as Thaddeus slept through the whole event and I mused how like the labyrinth journey it was: we start out asleep as we walk, but then through the twists and turns of life we become more awake to the process and the power and the peace available on the Path. 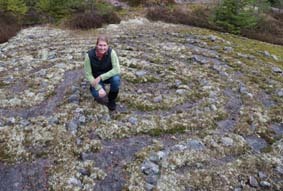 Carol Maurer, Projects/Special Projects Chair: I was using a finger labyrinth when I experienced one of my most powerful walks. 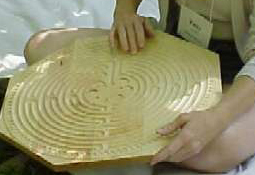 The labyrinth was crowded so I decided to walk one of the finger labyrinths while I waited for my chance to walk. 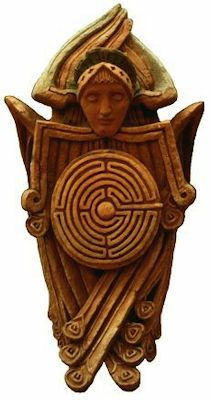 As I settled myself in the chair I noticed a friend, Diane Terry-Kehner, was about to enter the labyrinth. I moved my finger along the labyrinth, matching the pace of my finger to Diane’s walking pace, breathing slowly and deeply sending my friend love and energy along the way. 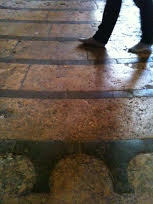 Kay Sandor, Secretary: My first Chartres Cathedral labyrinth walk took place in 2005. I attended one of the fall Veriditas pilgrimages when Matthew Fox was the featured teacher/leader. I stayed at the monastery and spent an amazing week exploring the cathedral and learning about Green Man and Fox's controversial notion that we come into the world with an original blessing rather than original sin! 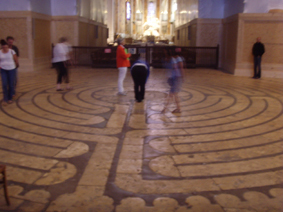 Beth Langley, Nominating Committee Chair: While my personal preference is for classical labyrinths—I love the rocking back and forth pattern—one of my most memorable labyrinth experiences was at Chartres Cathedral. During the walk I began to think of all the many people who have walked that labyrinth. That thought led me to think of all the people I am connected to, and I began imagining them all walking with me on the path. Jodi Lorimer, Education Outreach: I rode the bullet train starting at 4 a.m. from Avignon to get to Chartres by 2 p.m., exhausted, and just sat on the steps to watch as people came in. A German tour camped in the center of the labyrinth to hear about the rose windows and were oblivious to any who tried to walk it, a group of Chinese refused to walk across it but went all the way around it, a middle-aged woman stood at the center praying over crystals, a little girl in pink boots ran at high hilarious speed through the courses, a man blew in the door focusing on the windows and looked like he’d stepped in something, which was the labyrinth. I was captivated by all of the very different responses to this amazing symbol, lying so quietly, but charged, on the floor. Lars Howlett, Web/World Labyrinth Day Chair: When I met Jeff Saward in Chartres in 2011, I told him of my plans to continue to Sweden to reconnect with my roots and asked if there were any Scandinavian labyrinths he'd recommend. 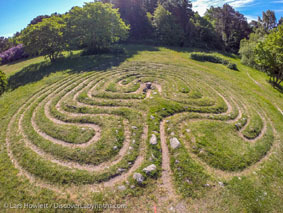 Surprisingly there are more walkable historic labyrinths in Sweden than anywhere in the world and he suggested the island of Gotland that's home to over 40. Walking these ancient paths of worn rocks with aging lichen, I couldn't help but wonder if the labyrinth held a special place in my great grandparents’ spiritual life as it now does so in mine. Janice Lewis, Membership Chair/Regional Reps: Three years ago on a significant birthday, my husband gifted me a wonderful vacation to France. While there, we saw many historic and famous sights. And the day that we spent at Chartres Cathedral was the best day of our trip. It was meaningful and magical!